The Thrifty Mommy: Vacation Time is Here......8 Great Ways to Save!!! Vacation Time is Here......8 Great Ways to Save!!! I cannot believe Memorial Day is upon us already.......that means vacation time is here!!!! Summer family vacations are so exciting...a great time to have lots of family fun and relax. All year I try hard to save a little here and there...so this way when we do vacation I can splurge on fun things for us to do....hence the word vacation, right?? There are a few tips I would love to share on some great ways to save while having a great time too!! I promise they will not take the fun out of your vacation at all!!! 1. Plan Ahead....This can really save you a bit of money!!! Check websites of places and attractions you think you might like to visit, check prices, see if they have any weekday daily rate specials, offer coupons if you sign up for emails, and even check to see if they have any reviews to read. Maybe it is not suitable for children and you have 2? Do your homework before you get there to save you un-needed stress before you get there. 2. Mix it Up.....There are many free or low cost things to keep your family busy while on vacation....slip in a pool day, a day at the beach, visit a local park and have lunch, and be sure to check out this website to get a nice list of fun free things to do in almost every state! 3. Avoid the ATM- This can be a very easy way to save a little bit of money and save you time as well. Bring a credit card and some cash or traveler's checks to last threw the duration of the whole vacation. This was you will not have to worry about where an ATM is located and whether or not you will be charged a couple of bucks to use it!!! 4. Pack Snacks- If you have kiddies this is a MUST!! If you are traveling by car you can even pack a small cooler with juice boxes and water bottles too..sometimes moms and dads get thirsty too...LOL LOL This will eliminate the need to stop for snacks at rest stops, concessions stands, convenience stores, etc. and this way you can buy them on sale before you go!! 5. Visit Restaurants For Lunch - It's vacation....so you are going to eat out...and you should it is vacation after all!!! But if you want to save a bit on eating out dine out at a nice restaurant for lunch, as it is often way cheaper than dinner...and if you have kiddies another perk of lunch out is a way less crowded restaurant at noon time than the dinner hour!! 6. Coupons & Discounts- Look for them before you go, and even when you get there!! In most popular vacation spots most have tourism centers that have lots of coupon books, planning guides, and they are great spots to find out about upcoming event days and promotions. At this time of year you can purchase an Entertainment Book for under $10...and it may be worth it for you to get if you are going away for at least a week or two. You can even preview some of the coupons for the book you are interested in too. Click here to view. If you have a AAA membership, they also have a program called "Show your card and Save" Simply show your AAA at participating merchants and you can save at thousands of merchants. 7. 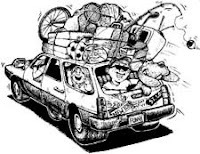 Pack Smart- If you are traveling with kiddies and you are going to Florida in June...you know it will be sunny skies above, so be sure to pack the sunblock, camera, swimmies, towels, beach toys, etc. Go prepared. Trust me the sunblock at home on sale can be just a few dollars...in a grind at the Stop N Go Market it could be double the price!! AT this point you now have no control over the cost and they know that!!! 8. Make Your Hotel Room Work For You- Be sure to pay attention to room options available.......look for perks like a mini fridge, a coffee maker, FREE Continental Breakfast, FREE Wi-Fi, a kids game room, pool, or whatever else will help to make your room more comfy and suitable for you to enjoy your vacation perfectly. Do you have another to add to the list...Is there a way you and your family save on your family vacation?? Please share!!! Ohh...and have a great, fun, thrifty vacation!!! Do You Hang Dry Your Clothes?? Are You An Overstock Shopper?? Playskool Diapers...Now Is The Time to Try Them!! Playskool Diapers from CVS....Worked For Us!! Are Your Kiddies Big Juice Drinkers??? Memorial Day...Are you Painting This Weekend?? Steve and Barry's...Have You Been?? Rotating Toys...It's a Great Thing!!! Tents...Lots of Fun for The Kiddies!!! Are You Cutting Back on Groceries??? Taking Dad Out on Father's Day?? Payless....Have You Shopped There Lately??? My Acme Trip...A Good One!!! Are You a Cheap Taco Lover??? Tons of Diaper Clearance At Acme!!! A Few Freebies For You...Happy Wednesday!!! Kraft Bagel Fuls.......We tried them! Have A Little Swimmer in Your House?? To Help You With That Mother's Day Gift...Maybe?? Need a Nice Mother's Day Card...On the Cheap??? Ottoman's A Great Deal.......Need One???? Overloaded on Baby Food Jars....Perfect!!! Where Will You Spend Your Stimulus Checks??? First Ever Giveaway!!!! Happy Friday To You!!! My Quick CVS Run....For the May Deals!!! Baby Lotion...Is Name Brand Better??? ?